On new year’s day the tradition of the “Nieuwjaarsduik” (“New year’s dive”) attracts quite a number of crazy daredevils. They are rewarded with a cup of “erwtensoep”, provided by Unox; one of the bigger Dutch brands. – “Dat is niet veel soeps!”: that is of low quality. – “In de soep lopen”: to become a mess. Lit. : “to walk/run in the soup”. – “In de soep laten lopen”: to make a mess . A popular brand for instant soup is Cup-a-soup. 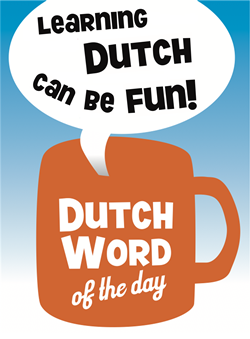 The tv-commercials have the theme “Vier uur, Cup-a-soup! Dat zouden meer mensen moeten doen” (4 PM, Cup-a-soup! That’s something more people should do.) They usually revolve round the same theme of somebody making a mistake because he or she is tired and needs some energy (as opposed to the successful people that take cup-a-soup). Below are a few links to such commercials. Living in Brussels, it is high time I learned to speak Vlaams but well, you know, I don’t really need to ‘cos all you Dutch speakers speak such brilliant English. However, the bite-sized bits of vocabulary on this blog are an excellent appetizer. My favourite Dutch (or Flemish?) word is: Snoepgoedwinkel. It sounds like some magic formula that would wake up a princess after 100 years.